DayClips offers a comprehensive real-time online appointment system that facilitates appointment scheduling directly from your website. All you do is paste the scheduling link or your menu of services provided by DayClips into your website. With DayClips you can also customize your own image to link with real-time scheduling. With DayClips your office avoids phone tag or email tag. Visitors to your website schedule their appointments before moving on to another website. Patients schedule their appointments through your website 24 hours a day in real-time!. 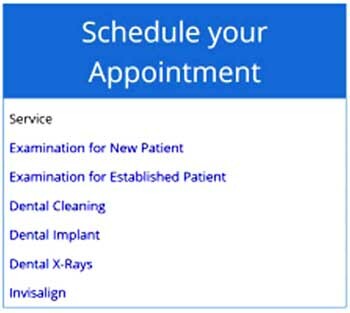 Patients have the opportunity to continue using your website to schedule their appointments. Your website becomes increasingly valuable as a point of access for existing patients who recommend new patients. Appointment tools from DayClips makes scheduling as easy as booking an online airline reservation. DayClips provides a master calendar that combines appointments made through your website with in-person and telephone appointments. DayClips accommodates patients who prefer scheduling appointments by telephone or in person. Integrating appointments from different sources into a master calendar is a key feature of DayClips. Real-time appointment scheduling from your website can be a huge benefit for your office. DayClips offers superior appointment scheduling to effectively manage your time, maximize the usefulness of your website, and power your practice. Click here to Sign Up and try DayClips for free!